As delighted as The Astronomer and I were with our dinner at Eleven Madison Park on a previous trip to New York, a repeat visit wasn’t in the cards this time around because much to our dismay, the restaurant had changed its winning formula. In place of the elegant and beloved grid menu filled with whimsical and seasonal bites is a $195 tasting menu paying tribute to the history and spirit of New York City. While the idea of a “Hudson Valley carrot tartar” and a “Central Park picnic” sounded neat, the changes reeked of pandering to “The World’s 50 Best Restaurants” list, which made me feel inexplicably sad and not the least bit hungry. To get our fill of Chef Daniel Humm’s cooking and General Manager Will Guidara’s hospitality, we headed instead to their latest venture inside The NoMad Hotel. 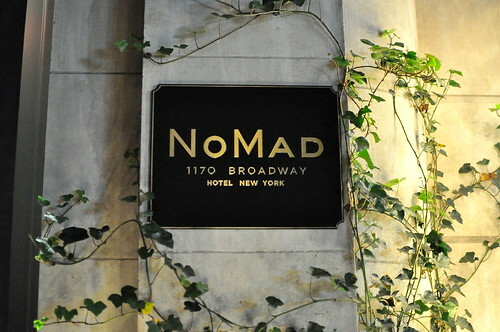 The NoMad Restaurant is slightly less formal than Eleven Madison Park, with dark and moody dining rooms furnished with banquettes so plush that I had to sit on a pillow to see over the table. 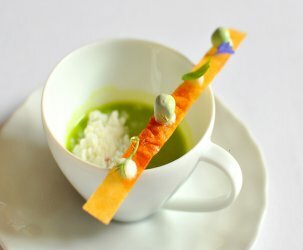 The a la carte menu here was “inspired by Chef Daniel’s time spent throughout Switzerland, California, and New York City,” according to the restaurant’s website. To start was a fantastic loaf of charred onion focaccia with sweet potato, rosemary, and sage served warm from the oven. 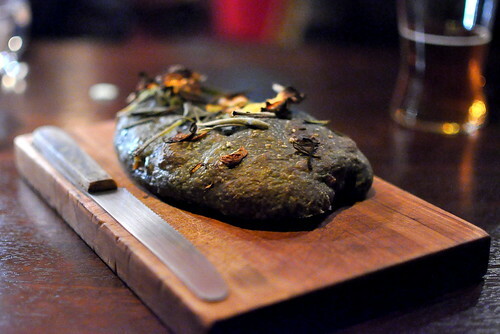 The bread’s intriguingly dark tone was accomplished using bamboo ash. I selected my appetizer, a beef tartare with cornichons and horseradish ($16) served with toast points, from the “Snacks” portion of the menu. It was a perfectly palatable preparation, but it lacked a certain spark to set it apart from all of the beef tartares of the world. 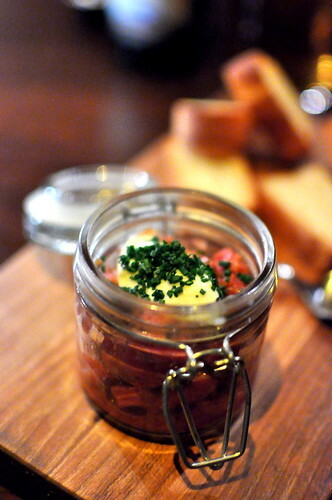 The beef tartare at AOC in Avignon…now that one had some serious spark! 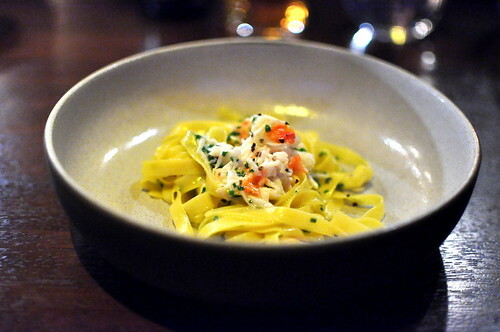 The Astronomer’s tagliatelle with King crab, Meyer lemon, and black pepper ($20) was simply divine. 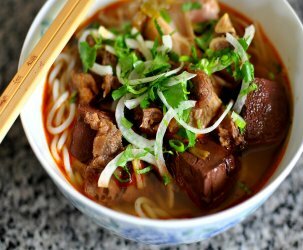 It’s impossible to go wrong with tender, handmade noodles topped with sweet hunks of crab meat, I tell you. 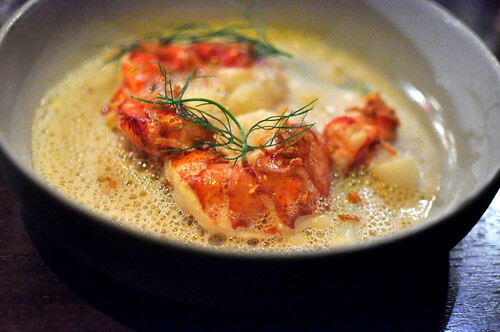 For my main course, I zeroed in on the lobster slow-cooked with fennel, orange, and black olive ($36). The star of the plate was generously portioned and perfectly cooked. While I quite liked the dish’s mellow, clean flavors, I yearned for something a little out of the ordinary to excite my palate. 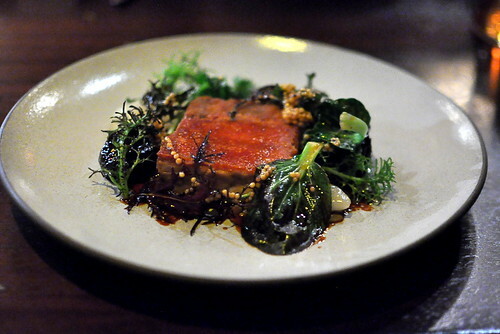 The Astronomer’s suckling pig with dried plums, onions, and wild greens ($35) brought the bells and whistles that my lobster lacked. The pig’s skin was shatteringly crisp, while the stewed prunes paired delightfully with the pork. 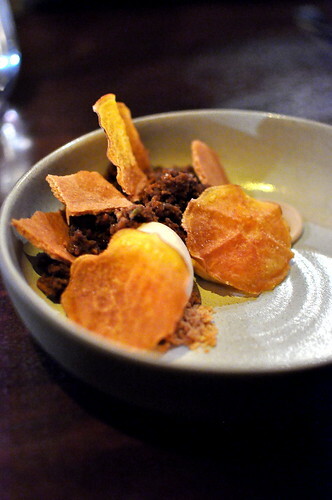 To finish, we shared a sweet potato custard with gingerbread, maple, and chestnuts ($14). The dessert’s various creamy and crunchy elements made for an immensely satisfying finish. 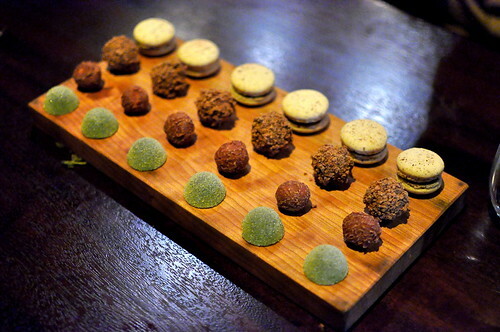 A plank of mignardises arrived with the check—the green apple gelee and the lapsang souchong macarons were my favorites. 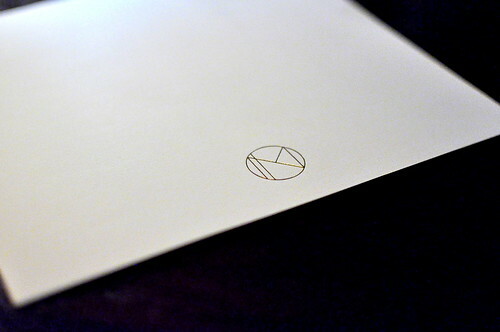 Dinner at The NoMad was very much solid, but not quite the wow-inducing dining experience that Eleven Madison Park is. 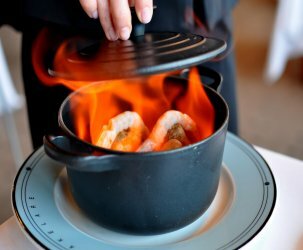 I was hoping for more fireworks on the food front and dishes that didn’t play it so safe, but perhaps that was too much to expect from a restaurant tucked into a swanky hotel. Thanks for the review. I love Eleven Madison Park. I heard Daniel Humm was going more ‘molecular’ with his EMP menu, so I was actually glad to see these dishes a bit more conservative. Something tells me if you are going to compare future tartares to the one you had in the South of France, you’re going to be disappointed for a while. I remember your AOC review and all the dishes looked very impressive. Aww, I love this place! Sad it didn’t wow you. Sounds like a solid meal, even though it wasn’t everything you hoped and dreamed it would be. Interesting recap. Having never been here or EMP, I’m not sure how they’re supposed to compare but if I have a chance for just one meal here it’ll probably be EMP.